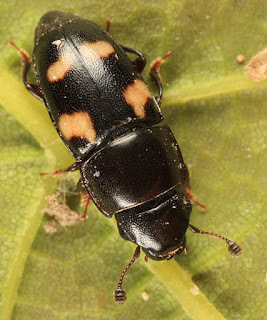 A picnic beetle, a common type of sap beetle. attracting sap beetles to your garden. beetles and reduce their numbers. However, the challenge is that there is an interval of time between when a product is applied and when the fruits or vegetables can be safely harvested. You can find this information by looking for the Days to Wait to Harvest number on the pesticide label. Depending on the product, this can take days or even weeks. By then the sap beetles have likely returned. If that is the case, try to use a product with as short of a time interval as possible.